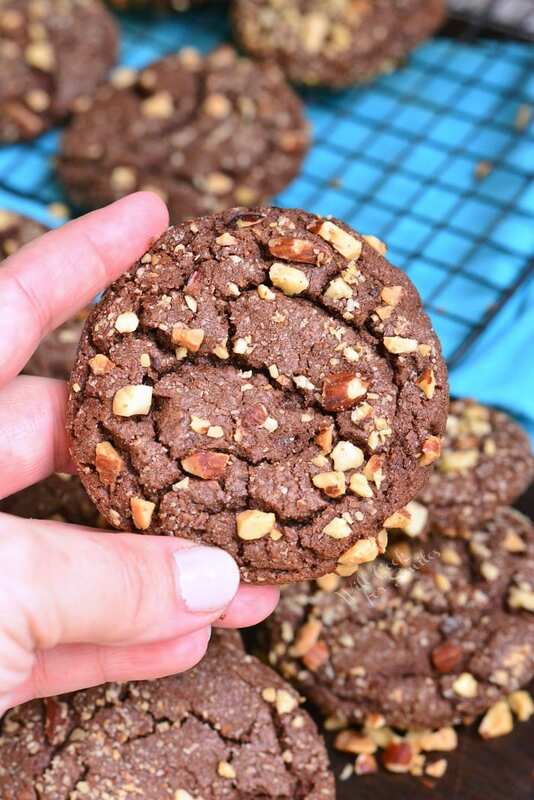 Sweet Nutella Cookies are soft in the middle and crunchy on the outside. These chocolate cookies are loaded with Nutella spread in the dough and coated with crunchy nut pieces. They will make a very special treat for everyone who loves Nutella. It’s officially cookie baking season. This is my family’s favorite time of the year because we always have cookies at home. The house smell like freshly baked cookies almost every day and it’s truly the best scent to walk into. Every time my husband gets home from work, he sees the twinkling lights and smells the cookies and it definitely feels like holidays. Christmas lights and cookies create the best holiday feel. So lets start baking some cookies. 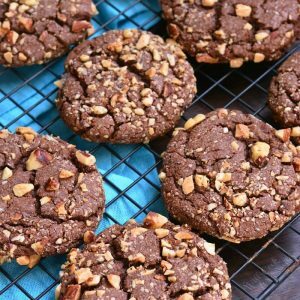 And, if you’ve ever been caught with a jar of Nutella and a spoon, these cookies will be perfect you. They are loaded with Nutella spread and coated with crunchy hazelnut pieces. These cookies are soft in the middle and crunchy on the outside. This awesome texture is easily achieved by slightly under-baking cookies. If you can’t find hazelnuts or simply don’t want to use them, you can easily substitute almonds. Can these cookies be made ahead? Absolutely! These cookies actually need to be refrigerated for about 4 hours, so they can easily be refrigerated overnight. Just make sure to cover the cookie dough tightly with saran wrap. Yes, these cookies can also be frozen. This recipe makes about 24-26 cookies. It that is too many cookies, you can freeze half the dough. You can freeze half the dough or all of the cookie dough. Prepare cookie dough per recipe but instead of refrigerating, roll cookie dough balls instead. Place cookie dough balls on parchment paper lined rimmed baking sheet and freeze them for about 2 hours. Transfer frozen cookie dough balls into a freezer bag, remove as much air as you can, and seal the bag. To bake frozen cookies, you do not need to thaw them. Just place them about 3 inches apart on the parchment paper lined baking sheet and bake as directed. Remember to add a couple extra minutes to bake time since cookies will be frozen. Soft chocolate cookies made with a generous helping of Nutella in the batter and coated with crushed hazelnuts. Beat butter in an electric mixer on medium speed for a couple of minutes. Pour in sugar and beat butter and sugar for a couple more minutes. Add eggs one at a time, beating well after each addition. Scrape sides and bottom of the bowl. Beat in Nutella and vanilla extract. Scrape sides and bottom of the bowl. Add flour mixture on stir it in on low speed until just combined. Cover cookie dough tightly with saran wrap and refrigerate for about 4 hours or overnight. When ready to bake, preheat oven to 350° and line a large baking sheet with parchment paper. Use cookie scoop to form cookie dough balls. (#30, #40, or #50 cookie scoop can be used. Just add or take away a minute or so of bake time for bigger or smaller cookie scoop.) I use #40 scoop and bake for 12-14 minutes. 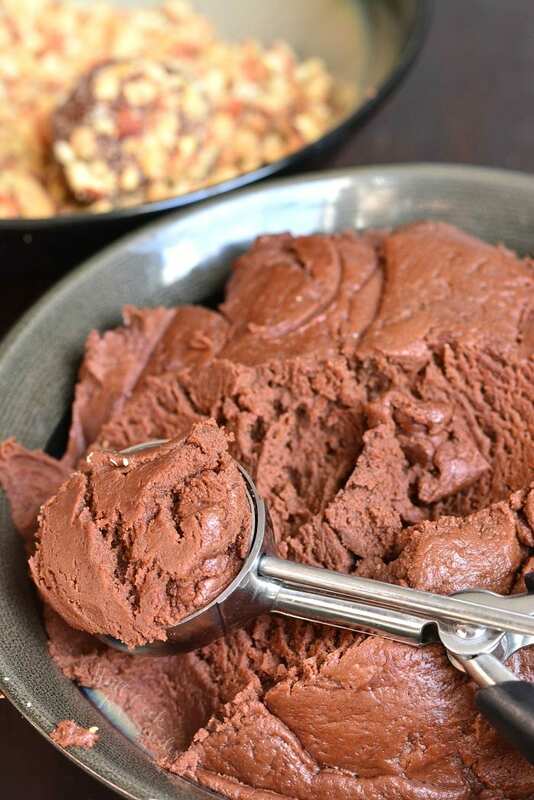 Scoop cookie dough and roll a ball quickly. 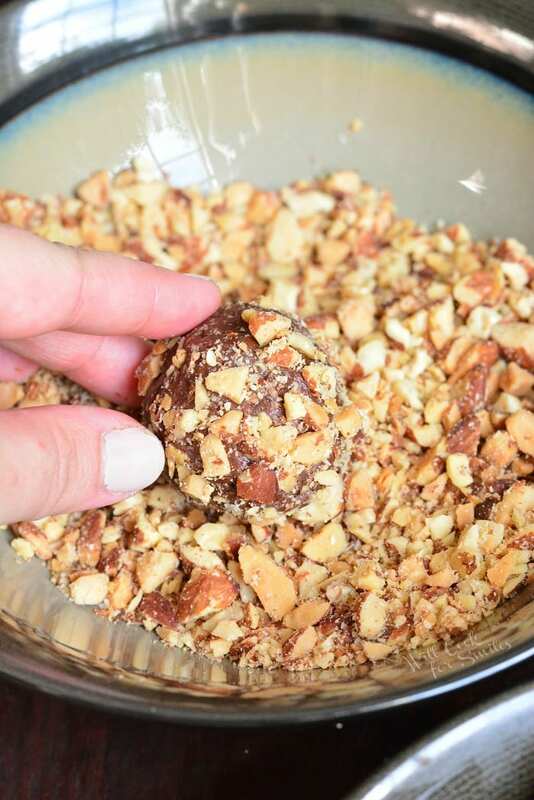 Roll cookie balls in crushed hazelnuts and place them on the baking sheet about 2 inches apart. My 9 year old son was inspired by the Kids Baking Championship and wanted to practice some baking at home. We scrollled through Pinterest when your recipe caught his attention. We made these right away and they are a new family favorite! 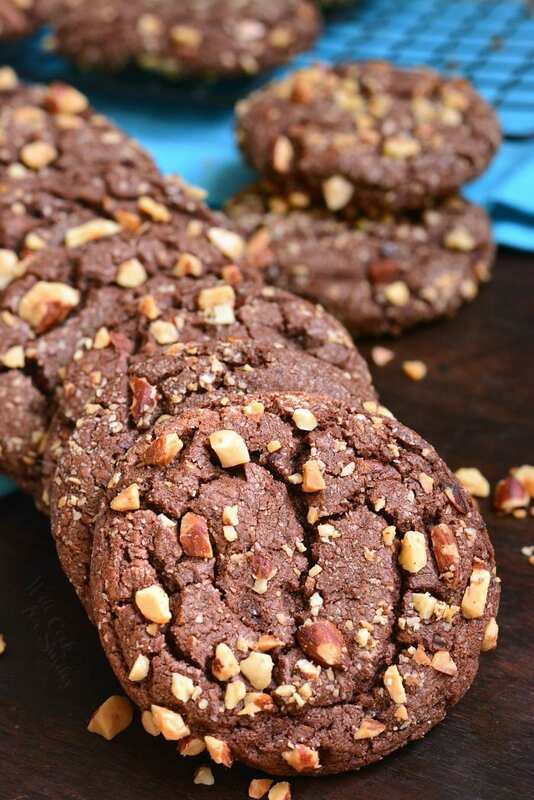 The perfect chewy middle with crisp outside; a rich chocolate flavor that are not overly sweet and have just the right saltiness from the nuts (we used almonds) on the outside. Thank you so much for a great recipe that we will make over and over again. That is SO awesome!! Thank you so much for coming to tell me. Can I use everything without brown sugar as we haven’t got any and shops are closed?